Handcrafted New Hampshire wine is made right here, in our full-production commercial winery. Take a sip. Take a tour. Take a break from the ordinary. The winery produces wines from classic European grape varietals such as Cabernet Sauvignon and Chardonnay as well as locally-sourced fruits like blueberry and apples. There are around a dozen or so different wines to sample and to purchase right in the wine shop at RiverWalk. The grapes are from around the world, but the wine is pure NH at its best. 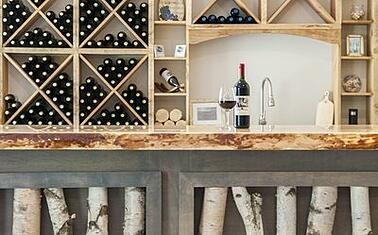 The Seven Birches tasting room is open daily in the afternoons and evenings for wine sampling. Taste a specific wine you are interested in or fancy a flight of your choice of 5 wines that peak your interest. All wines that are on sale are also available to taste. With the White Mountains and the Pemigewasset River as your backdrop, an afternoon of wine tasting and casual, fun conversation with family and friends is a special occasion. Seven Birches Wine Club or Barrel Club. With the wine club, you get special privileges in the winery and special deals on wines you like, delivered to your room or mailed to your home. The Seven Birches Barrel Club is the ultimate in winemaking and wine ownership, giving you the opportunity to custom-create your family vintage. Seven Birches Winery also offers "Meet the Winemakers" tours of the winery. This is an outstanding way to discover wine, and how it is handcrafted right here in our resort. There are public tours on Saturdays, and a special private tour for resort guests on Tuesdays.